New strategies are being created in business to promote products and services. Video marketing is one of the most effective techniques available to educate people about your product. A marketing video shows the capabilities of the products and services being promoted. 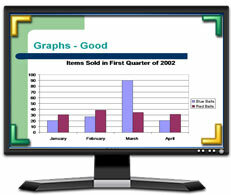 My Screen Recorder allows you to record your PC screen into a video which can help explain and describe a product. You can even add your own voice narration when making the screen recording. Once the video is created, you can easily post them to YouTube or any video sharing website. Video marketing may include showing a website, training videos, PowerPoint presentation, or a software demonstration on your PC. Any PowerPoint presentations used in your business can go online. Just record your presentations and post them to web. We, at DeskShare provide tutorials for every product. Click to view a video tutorial on My Screen Recorder. Video is an excellent way to teach a subject. In large corporations, the expense of staff training programs is increasing. When a company has large and geographically diverse audience, a training video can help. It dramatically reduces the costs and makes the training information easily available. Producing a training video often gives a great deal of information in a short amount of time. When you are making a video, you can use the mouse pointer to act as a visual aid for viewers. if you mean more visual effects to highlight and draw on the screen then try our professional version, My Screen Recorder Pro. It also includes other useful features such as auto publish to any FTP account including YouTube.